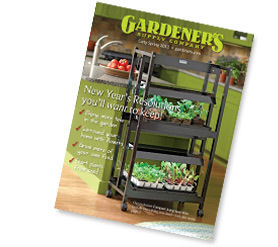 Ok, I admit it…the reason I’m blogging about container gardening is because I received (drum roll, please) the summer 2012 issue of the Gardner’s Supply Company catalog!! I also admit that after I put my daughter to bed last night, I sat, with my furry orange cat, and read the entire catalog cover to cover. What fun!! I’m already dreaming of those tasty tomatoes and veggies! Here in NC, I don’t usually begin to plant early summer veggies until after tax day. By that point we are usually safe from having a frost AND I view getting the garden started as a reward after doing taxes. As I mentioned last week, here is part 2 to our post on Easy Container Vegetable Gardening….enjoy! Below are steps 5-7. If you didn’t catch steps 1-4, click here. In order to prevent soil from blocking water flow away from your plants, use Styrofoam peanuts, rocks, mesh screen, or broken pottery to loosely cover the bottom drainage hole. You want your container to be 3/4 full, but remember that a small layer of Styrofoam peanuts can be added to the bottom of your container to decrease the amount of soil (and weight) needed for your container. soil such that the container is 3/4 full with material. Individual seeds have different growing requirements and seed packets come with instructions which provide information on how deep to plant your vegetables. Watering will be the most important and time consuming part of raising a container garden. Containers can dry out very quickly, especially outside on a sunny summer day. Daily or even twice-daily watering may be necessary. Feel the soil to test its moisture level. If the soil is damp, no more water is needed but be sure to check again tomorrow! standing on top of it. Be careful not to overwater! If you use a soil mix with fertilizer added, then your plants will have enough nutrients for 8 to 10 weeks. If plants are grown longer than 8 to 10 weeks, add a water-soluble fertilizer (such as Miracle-Gro) in the amount recommended on the package. Repeat every two to three weeks. A special thanks goes to Lauren Paynter, co-author. The only thing I can grow in a container is my fig tree because the deer do not touch it. Thanks for your reply. I know how you feel…I recently found 16 deer standing in my front yard. Have you tried the garlic rods that Gardner’s Supply Co. sells to help combat deer? I’m thinking of trying them around my containers this year. Reblogged this on Potted Plant Society. Great advice! 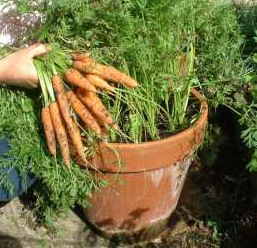 My attempts at container gardening haven’t yielded very encouraging results yes but I’m determined not to be put off! Has anybody had luck growing cucumbers in a container? My 3 year old son and I started our seeds indoors a tad too early…we were too excited!…and we still have a lot of snow fall ahead of us here in Maine. Pretty much all of our seedlings are ready to be transplanted but we will have to move them into bigger containers and pots until I can move them outside. The only ones I am really concerned about are our cucumbers. :-\ Any advice? I grew my cucumbers from seed in an outdoor container and they worked really well. I had 4 plants in one very large container. I added a tomato cage to serve as extra support for them. Loved your post on container gardening. I am so excited on getting started with this! I hope to do tomatoes, cucumbers and various herbs to start out. Any advice on herb growing? I have done parsley in the past, but, would love to try cilantro and basil.. thanks for your write up! Burpee has corn for large containers this year. It only grows a max of 4′ high! I am super excited about my corn this year. Hello! As a Registered Dietitian, I believe all age groups should have access to reliable nutrition information. However, nutrition resources for older adults can be hard to access, difficult to understand and may not provide usable information. My goal is to provide a resource for senior citizens and their families as they plan healthy meals to achieve peak health. The opinions expressed here are those of the individual authors and do not represent the views of The University of North Carolina at Chapel Hill or the Gillings School of Global Public Health.